Steep tea bags in 1 cup boiling water for 5 minutes. Squeeze excess liquid out of tea bags discard. Reserve tea. Meanwhile, prepare a glaze by heating margarine, brown sugar and cranberry juice into a saucepan over medium heat until margarine is melted and sugar is dissolved. Add tea and reduce mixture by cooking over medium high heat for 15 minutes. Set aside. 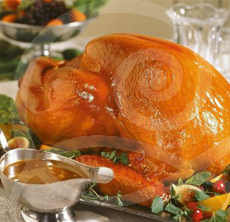 To prepare turkey, remove giblets and neck from turkey, rinse inside and out and pat dry. Place a cut lemon and a cut-up onion into the cavity and truss the turkey. Place in an open roasting pan breast side up. Brush skin all over with glaze. Bake turkey in preheated oven. Keep glaze warm on stove and continue basting with glaze every 20 minutes. Remove turkey from oven and let stand for at least 20 minutes before carving. Discard any unused glaze. To make gravy, dissolve potato starch in chicken stock. Place roasting pan on burner over medium heat, scraping browned bits. Add stock whisking constantly until thickened; about 1 minute. Strain gravy and serve with turkey. As a nice alternative, use an oven stuffer roaster chicken in place of the turkey, reducing tea bags to 8.